Called the "Christopher Hitchens of the Internet," Andrew Keen describes the ways in which an expanding circle of wealthy "monopolistic" companies like Amazon, Uber, Airbnb, Spotify and others are disrupting in ways that are hardly as noble as they want us to believe. Watch the provocative book trailer HERE and prepare for a deluge of intellectual debate and controversy. He has been called the "conscience of the internet" and "the voice of humanity amidst the digitization of our world," and The Internet Is Not the Answer is "the best and most readable critique of Silicon Valley yet." This book traces the technological and economic history of the Internet, from its founding in the 1960s to the creation of the World Wide Web in 1989, through the waves of startups and the rise of the big data companies to the increasing attempts to monetize almost every human activity. In this sharp, witty narrative, informed by the work of other writers, reporters, and academics as well as his own research and interviews, Keen shows us the tech world, warts and all - from hoodie-wearing misfit millionaires to the NSA's all-encompassing online surveillance to the impact of the Internet on unemployment and economic inequality. Andrew Keen is an entrepreneur who founded Audiocafe.com in 1995 and built it into a popular first generation Internet company. He is the executive director of the Silicon Valley salon FutureCast, the host of the Techonomy web series "Keen On," a columnist for CNN and has been featured in the national media, including on CNN, NPR and "Colbert Report." He has spoken at LeWeb, DLD, Disrupt, Next Web and TEDx. His books include Digital Vertigo and the Cult of the Amateur, and he lives in San Francisco. 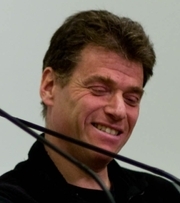 Andrew Keen is currently considered a "single author." If one or more works are by a distinct, homonymous authors, go ahead and split the author. Andrew Keen is composed of 3 names. You can examine and separate out names.